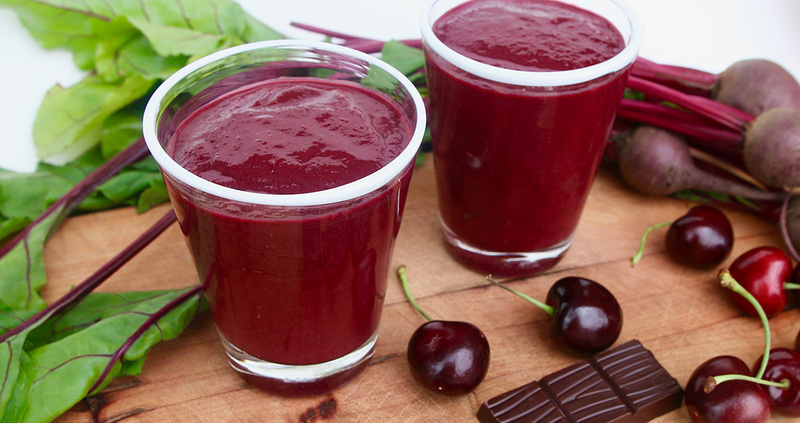 This smoothie is a powerhouse of goodies to help your body recover and rebuild after a workout! Beets and cherries are packed with minerals like folate, manganese, potassium, and copper, as well as antioxidants that help keep red blood cells healthy and oxygen-rich. All of these micronutrients work together to help with muscle recovery after exercise. Flaxseeds are a rich source of micronutrients too, including dietary fiber, manganese, vitamin B1 and omega-3 fatty acids, which lower cholesterol and stabilize blood sugar. Try swapping your raw honey for manuka honey in smoothies. This special kind of thick honey is made in New Zealand by bees that pollinate the manuka bush and has the unique ability to combat inflammation. If strength training has left you sore, the combo of Natural Vitality’s CALM Specifics Calmful Muscles and powerhouse ingredients in this blend will save the day. Place all ingredients into your blender and purée until smooth. You may want to add extra nut milk or ice for a more liquid consistency. The flaxseeds will make the smoothie thicken as it sits, so enjoy this smoothie right away!